PSI operates under one single mission: To provide specialty valves, instruments, control systems and mechanical products to industrial users throughout the Northeast, and to do so by providing unsurpassed customer service. Covering the states of Maine, Vermont, Massachusetts, New Hampshire, Rhode Island, and Connecticut through offices located in Portland, Maine and Danvers, Connecticut, PSI is well situated to provide quick delivery, on-site services, and engineering support all through New England. Piping Specialties, Inc. provides industrial valves, including ball, butterfly, gate, globe, safety relief, and control vales; and mechanical specialties including, steam traps, condensate recovery systems, steam water heaters, site level gauges, jet pumps, expansion joints, and modular pipe seals. PSI Controls provides automated industrial and commercial valve packages that include quarter-turn and linear valves, pneumatic and electric actuators, limit switches and valve communications; and process instrumentation & controls including level, pressure, temperature and flow instrumentation. 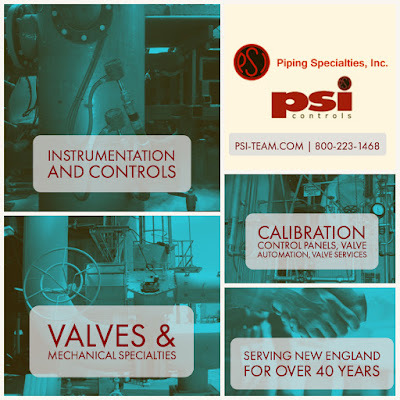 PSI Services provides installation of valve automation systems, valve repair, instrument repair, instrument calibration, turnkey systems and field support services.